Random animalia and the creepiest ad ever. 1. I am always lovin’ the beasties, but right now I’m going through a weird animal phase. For example, I recently cannot get enough of the capybara. 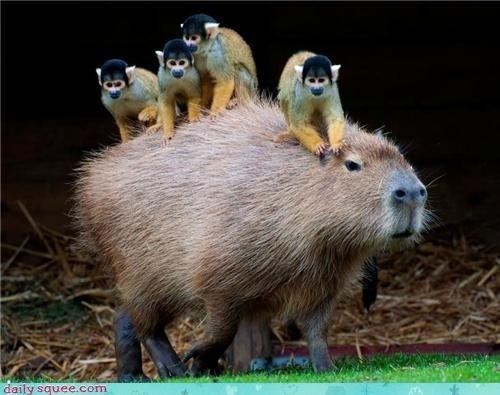 Let’s all look at a picture of a capybara with squirrel monkeys riding on it. She didn’t find that helpful at all. So thanks, YouTube, for further confusing Børkke. This is the most recent video that reminded me of two things about the capybara. One, they like water (They have webbed feet for swimming!). Two, either they are the most relaxed creature ever, or the stupidest creature ever. Jury’s still out. The other creature that fills me with a thirst for knowledge about it is the sage grouse. The female sage grouse is rather ordinary, but the male sage grouse, well, he has what appears to be two giant yellow testicles draped over his shoulders like boxing gloves. He keeps them inside these white feathery pockets, but when he feels like mating he pops those puppies out, which causes them to make a noise not unlike a very, very large leaky faucet dropping a very, very large drop of water. Needless to say, AWESOME. I also appreciate the delightful prairie chicken, who has smaller orange neck-testicles, pointy feather-ears and foot-stomping, but the sage grouse has my heart. 2. 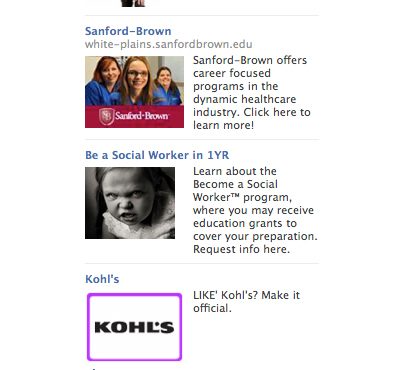 I was on Facebook the other day, and you know how they have those sponsored ads on the side? And how, more often than not, the picture has nothing to do with the ad? Well, this is what I got. AHHHH! Demon Child!! If social work has anything to do with this Chucky-doppelganger, I decline, thank you! I actually hit “refresh” in order to get an ad that didn’t have a growling spawn glowering at me. Pirate tugboat reborn – Part FINISHED! 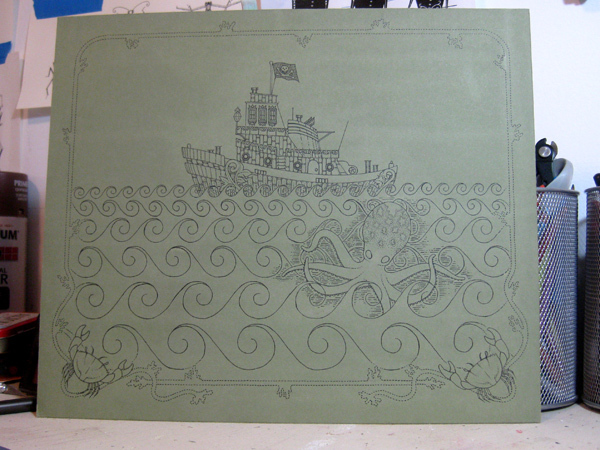 Okay, I finished the pirate tugboat part (aaaarrr) and I took a picture of it. And then I finished the sky and I forgot to take a picture of it. So you’ll have to take my word for it that the sky is very nice – pleasant horizontal lines representing pale clouds. In the meantime, tugboat! Pirate tugboard reborn – part 2. Booyah! 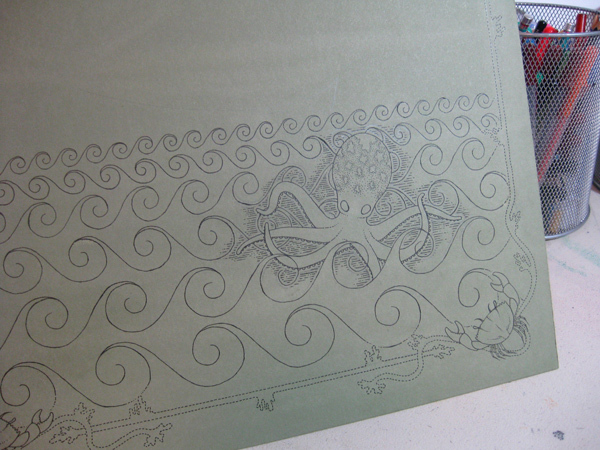 I have drawn a sea creature! So cute. 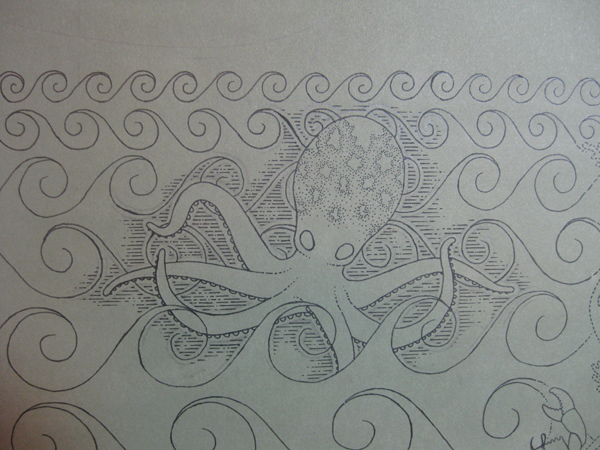 I’d like you to notice that this is an octopus, but you can only see six legs. That is because two are in the back, and are therefore blocked from view. Please don’t send me grumpy emails defining the word “octo”. Now, I must attack the pirate tugboat. We’re gonna get there, team. We’re gonna get there. 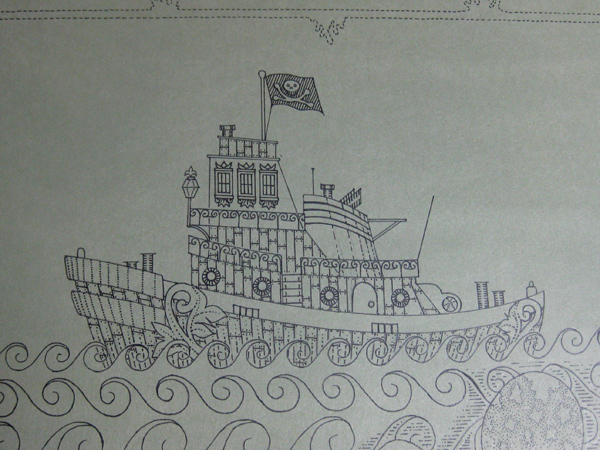 Remember the pirate tugboat drawing I was working on back in the day? This one? I’ve decided to give it another shot. I found a different board that’s a lot smoother, so my pen shouldn’t get snagged on the tiny ridges anymore, meaning a more controlled line. 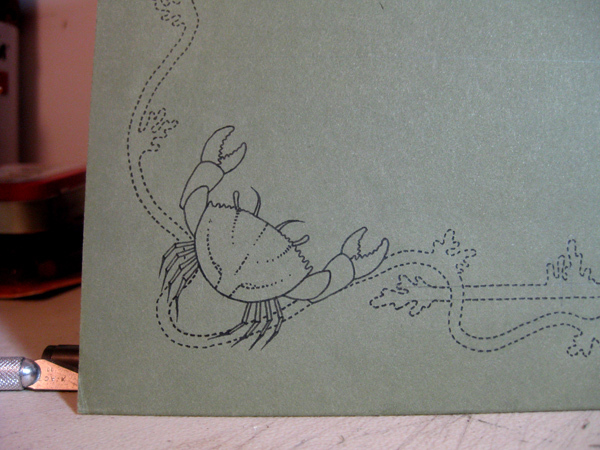 So far I’ve done the seaweed outline and the corner crabs. 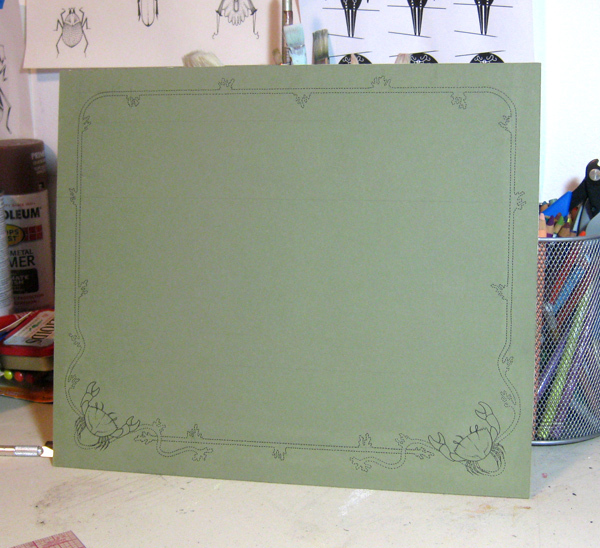 In order to get the waves as perfect as I want them to be, I’m going to have to cut stencils for each size of wave. A ton of work, I hope it pays off. 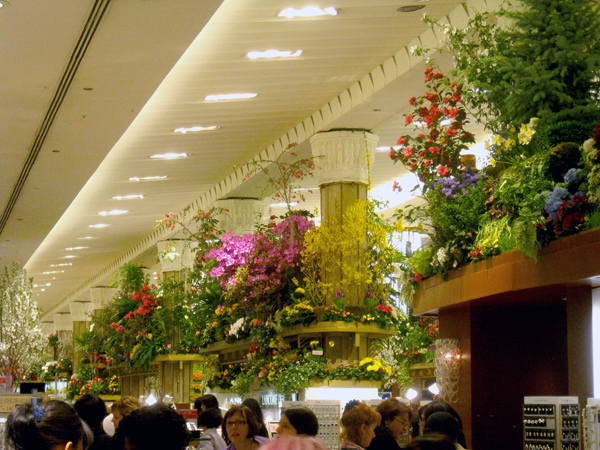 Flower show, people! Very exciting! 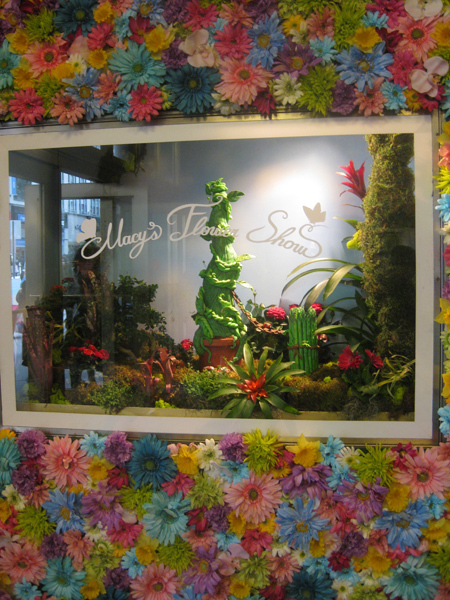 I don’t know if they had a cohesive theme this year like they have had in years past; it seemed a bit hodge-podge. But I’m not complaining. 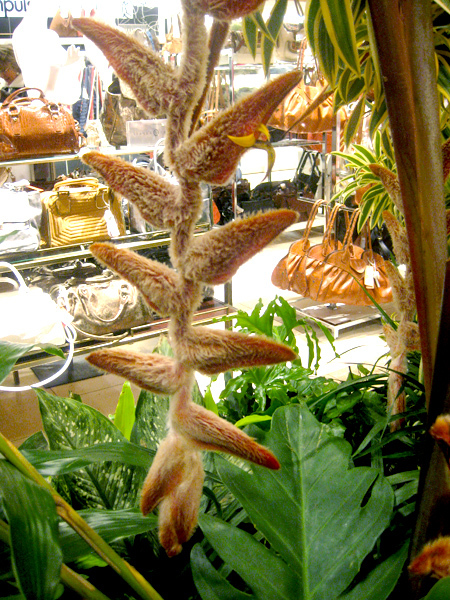 As always, all kinds of plants with bright colors and textures, oh, it makes me so happy. 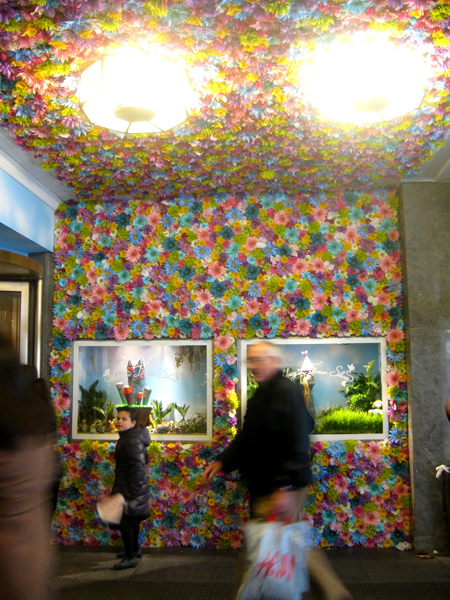 The entrance was a bit eh in my opinion, all fake flowers slapped all over the walls. 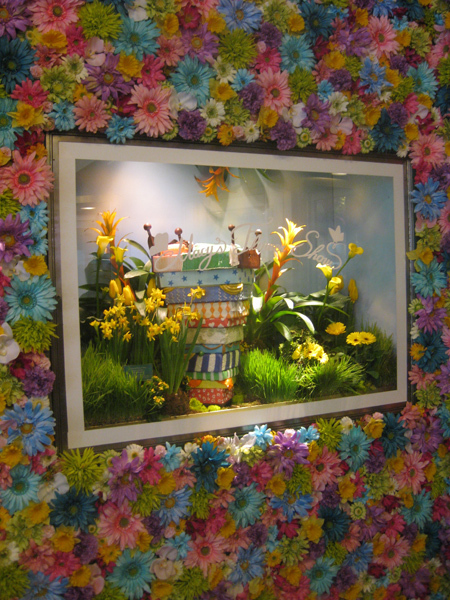 And in the window boxes were plants with cakes in the middle representing the different fairy tales. 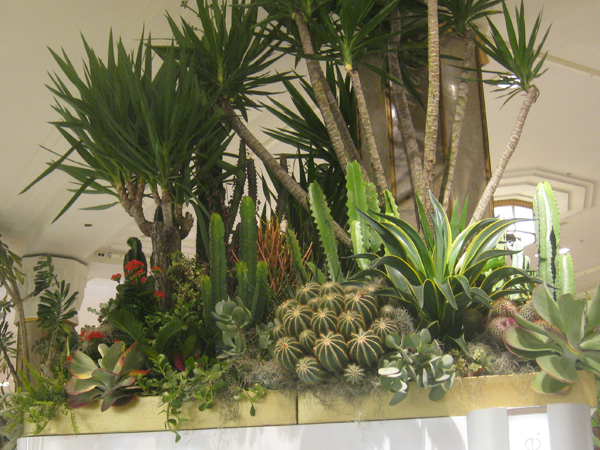 I gravitated towards the succulent window as usual, and the wee succulents were delightful. If I lived in a desert climate, I would pour all my money into my garden for sure. 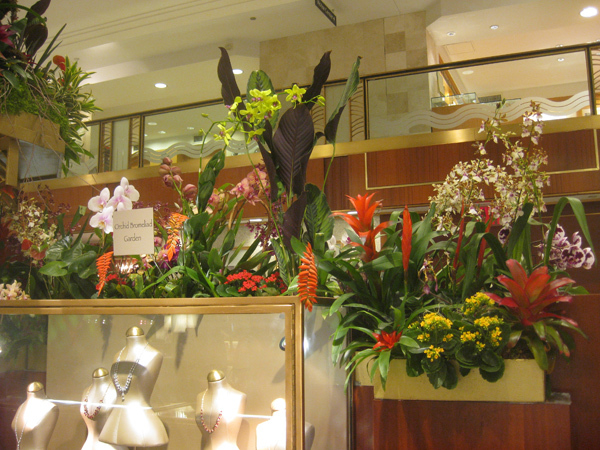 So, whoever was in charge this year was not afraid of the spookier plants, because as you came in and turned into the bag section – blammo! 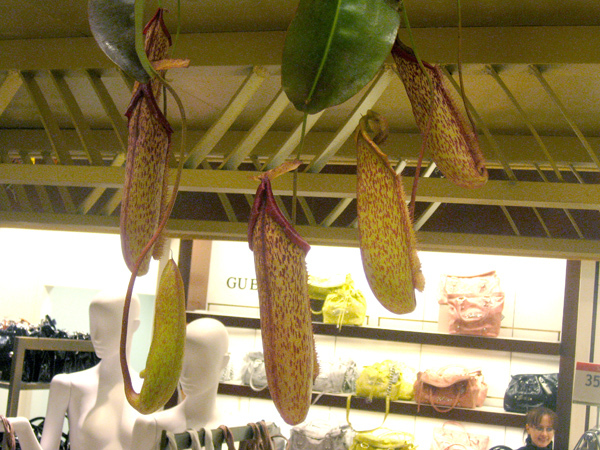 – you were confronted with giant freaky pitcher plants dangling in your face. They were so big and had so much presence when I almost bumped into them I said, “Excuse me,” to them. Nearby these monster pitcher plants was the aye-aye of the plant world. 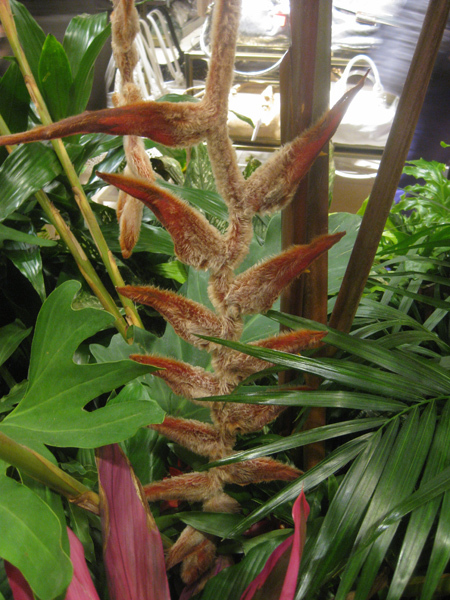 The were a thick, fleshy, reddish, pointy plant covered with whitish fur. It looked like someone with white back hair got a bad sunburn. That wasn’t the ickiest part though. It was the petals creeping out of the pods. 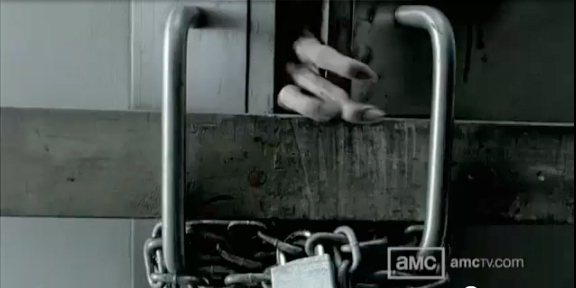 All I could think about is every horror movie where they show a door, and sloooooowly dirty fingers with jacked-up nails come around the edge of the door, and you know OH DEAR GOD HORRIBLE DEMON A-COMIN’ and then you cover your eyes with your hand (if you’re me). And then cactus cactus cactus. All kinds of cactii. 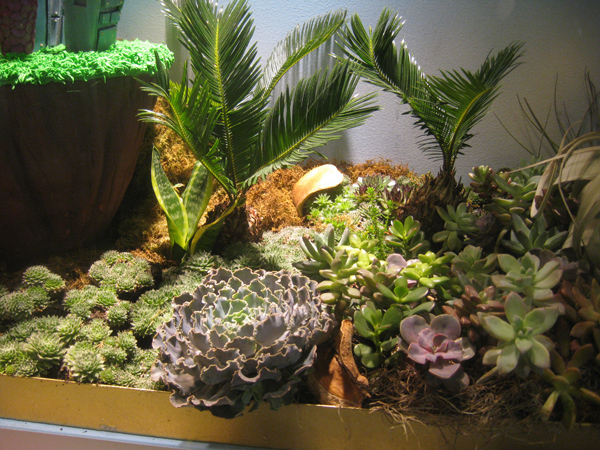 I love cactii and succulents so much because I think they look like totally alien creatures, very Dr. Seussian. 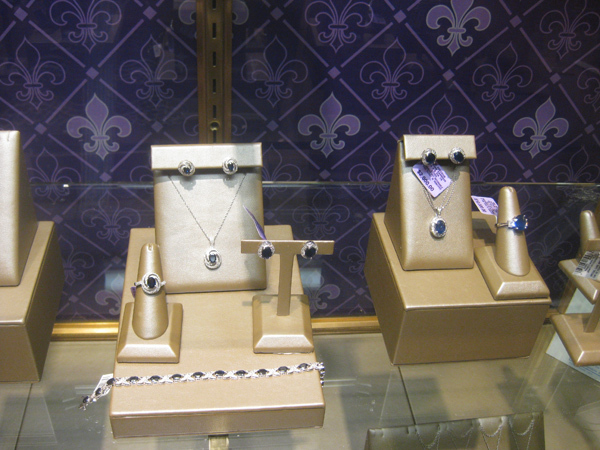 And there’s such a variety of sizes and shapes! I never cease to be enthralled by them and their wackiness. 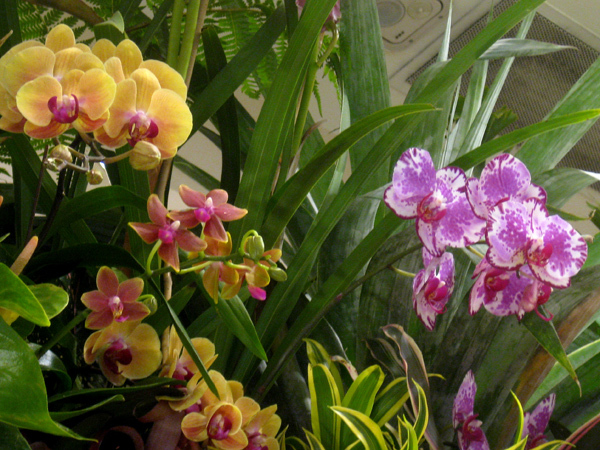 Also, orchids. Really stellar ones this year. 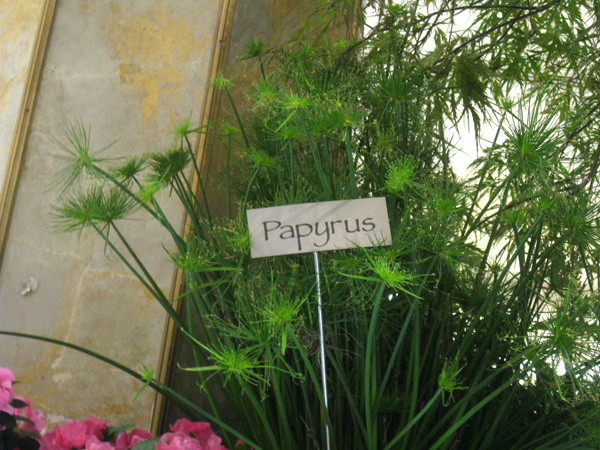 And, of course, no flower show would be complete without a picture of a papyrus plant with the little sign written in Papyrus font. 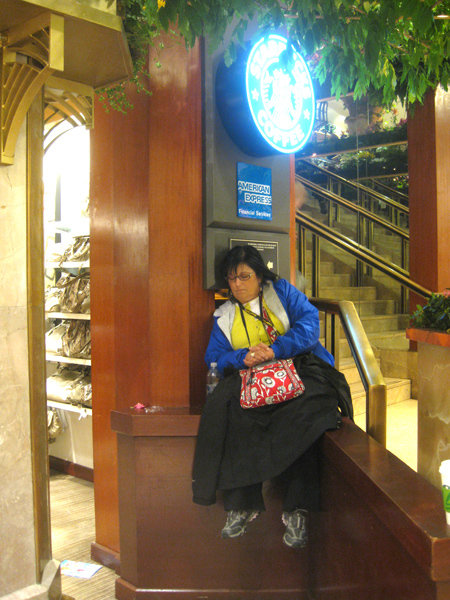 Additional flower show photos: woman exhausted and sleeping next to the jewelry section. 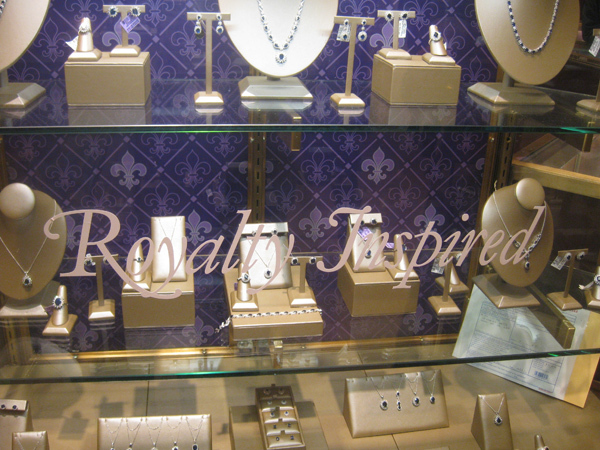 And the panderingest pandery thing ever: the jewelry case totally devoted to the look of former Princess Diana’s ring, now Kate’s ring. 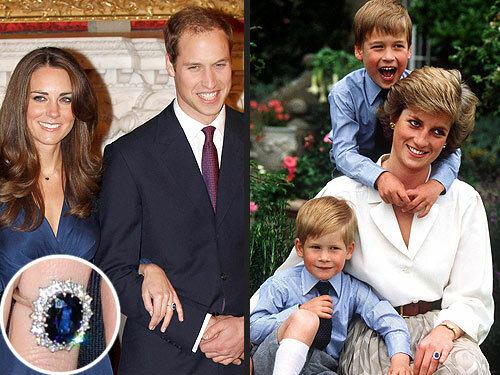 Here’s a pic of the ring. Reasons my family left Russia. You might think it was the persecution or the lack of opportunity, but you’d be wrong. It would be the wacky animals that get waaaaay too close to the humans. I work in a highly urbanized area. I am accustomed to interacting with squirrels or little brown birds. In Russia, it is different. I would leave too. Example 1: Cop stops guy at routine traffic stop, quickly leaps into vehicle due to a pack of wolves running by. Example 2: Cuddly bear who wants to eat your feet off. Notice the moonwalking at 0:40. And my favorite, Example 3: Wild hamster who looks like he’s wearing overalls. Hey, guys filming, hamster does not want to be petted. I made me a lariat! And now I never have to make one again. I am a bit obsessed with Laura McCabe lately (I’ve blogged about her before) because when I was in Michael’s a few weeks ago, I saw her book Embellished Beadweaving. I then lost my mind and decided to make a lariat for myself. I had no human conception of how freakin’ long it takes to make one of these things. Holy Moses, it took forever. 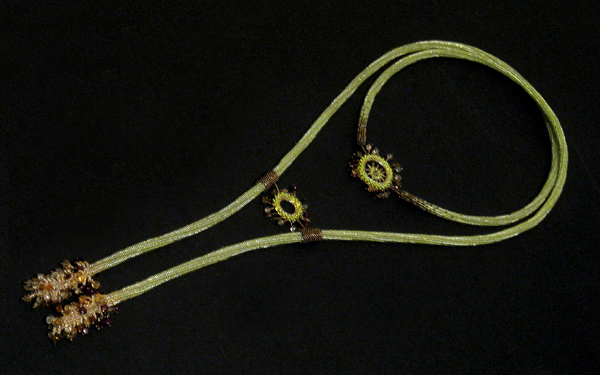 I just wanted a long green plain lariat with sparkly bits at either end, but I used a very stiff stitch called herringbone stitch, so when I finished it (several thousand hours later) and put it around my neck, it looked like I was being slowly choked to death by a garden hose which, shockingly, was not the look I was going for. So I sat there pensively trying to figure out how to solve my problem. 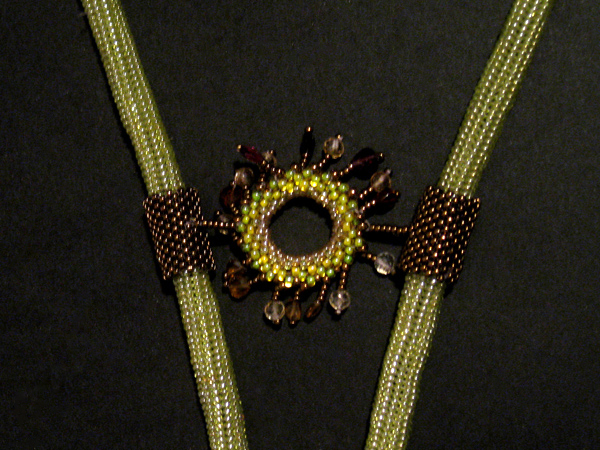 I decided to snip the lariat right in the middle and put a beaded something-or-other there to act as a hinge, and then I made a beaded doothangy to bring the two sides together so they wouldn’t migrate to my armpits. 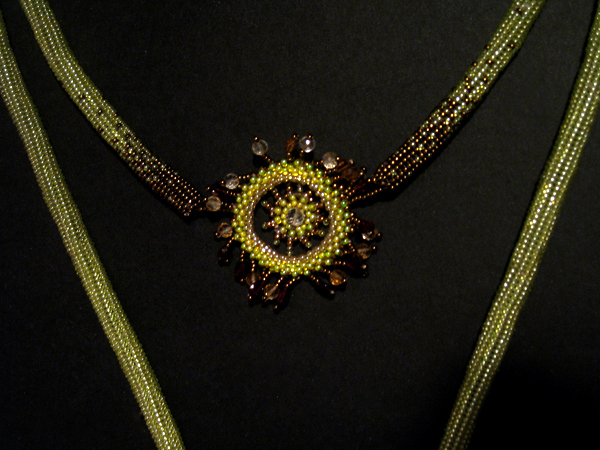 Finally, after like a month of non-stop beading, I am done with it and I must say it turned out pretty well. Hooray for me. I don’t know if I’ll ever make one again. 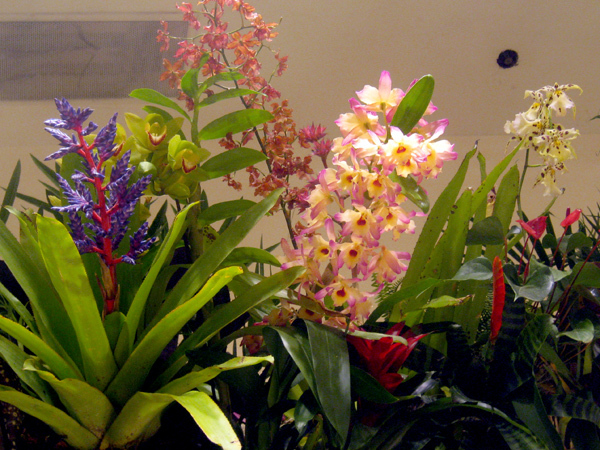 You are currently browsing the design-newyork.com blog archives for April, 2011.